My favourite fashion event of the year! Nowsadays, I only watch it for the fun fashions. All the better if the gowns are ugly. Since I can't skive work to watch it live, I am looking at the red carpet arrivals on oscar.com. Fun fun fun! She doesn't look too bad. Didja know David Gan did her hair? I adore Cate Blanchett, and most times she looks good. I like the shape but I dunno about the colour of the dress and that maroon sash thingy. That pale yellow doesn't really suit her colouring. I wish I had something snarky to say about Gwyneth, but I don't. She looks fabulous...grr. I've always thought Ms Cruz looked like a bird, and here I realise I am not wrong! She looks like Big Bird from Sesame Street! Did Halle Berry not learn from her lopsided gown from the Golden Globes?? This is an improvement but I'm a bit ho-hum about this dress, it makes her boobies look slightly distorted. 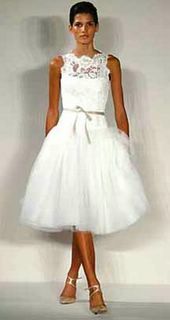 I have something against dresses/gowns that are short in front and long at the back, it tends to make one look stunted. Am also intrigued by that woman in the background. Who is she and why is she wearing an orange gown with a lime green pashmina and accessorised with a silver bag? The colours, they are dizzying me. Oh Johnny, why? You looked so hamsem last year! What happened? What's that? You forgot to wash your hair? Tsk. Oo-eer Kate Winslet looks like a goddess. Hurrah Kate! Tee-hee Puff Daddy/P. 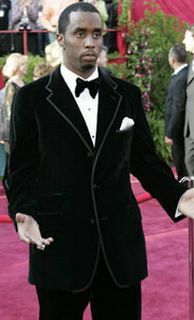 Diddy /Sean Combs decided to accessorise his velvet pyjamas with a bow-tie. Aww. Aieeeee! It's the Wicked Witch of the West! Renee Zellweger looks very scary, I think it's the colour of her hair. And she's wearing a red gown...again...boring. 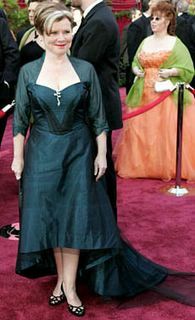 It looks unfinished, like there wasn't enough time to finish the top bits and she had to rush off to the red carpet. I no lika the hair. It looks like candy floss. In the name of the samurai"
A while back, I mentioned Samurai Champloo and how I wanted to get my hands on it. One of my friends has downloaded the fansubs and passed me a copy. So I have spent the last two weeks gleefully devouring eps 1-17. Can I just say how much I am enjoying this series? 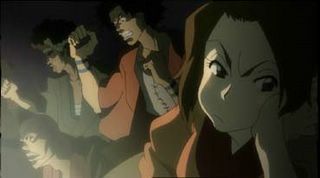 Everything about it is fabbo, from the well-thought out character design, super-detailed animation (I am so in awe of the amount of work that has gone into the realistic character movements and background scenery), choice of colours, cool hip-hop soundtrack and of course entertaining stories. My only gripe is that the main plotline, the search for the samurai who smells of sunflowers, is advancing...very...slowly. Episode 6 was only when you got any sort of clues. But I suppose many times, it is about the journey and not the destination. In any case, I'm itching to get my hands on the remaining episodes! I hear ep 21 is out already...hehe. Why? why?? Why would he do such a thing? I have always enjoyed reading his alcohol and dope-laced articles and biting political insights, especially all his escapades with Ralph Steadman. His dashing and engaging style was something I vainly attempted to copy in journalism class, with embarrassing results. So strange too, just when I have recently been re-reading one of his books. No, no I'm nowhere near getting married, just that I've always loved looking at bridal gowns. Maybe because of all those princess fantasies I used to have, playing Sleeping Beauty, Snow White and Cinderella in my nightgowns when I was 6. But with the number of friends who have been getting hitched in the last few years, I've been paying even more attention to bewdiful gowns. When I was in my teens, I made the grandiose declaration that when I got married, the gown would of course be Vera Wang. Of course now I realise not only is Vera Wang hideously expensive, she's kinda...mainstream now. Enter Monique Lhuillier with her old-school glamour, exquisite lace and ribbons gowns. I particularly like the one on the right, only I'd like it longer, maybe 3/4 length a la Molly Ringwald. Of course it would be helpful if I looked like that too. Is the paint thick enough to hold the cracks? I was such a good girl for the 3 weeks leading up to CNY, staying away from ALL cookies, cakes and ice-cream, but the well-laid plans went down the tubes starting last Mon. How to say no to pineapple tarts? Mon night: Dinner at Chef Chan's. Yu sheng, beef tenderloin, crispy skin chicken, steamed soon hock, pumpkin and chicken soup, spinach. No wonder the place is expensive, you're paying for quality. But what quality it is! Tues afternoon: Lunch with father at Marmalade Pantry. A big beef burger and a nutella cupcake. Tues night: Steamboat dinner at aunt's place, followed by three kinds of dessert - tong yun, Haagen-Dazs ice-cream and marzipan cake. Oooh such a pig. Wed: Full day of eating...how can one say 'no' when your aunt tells you the pineapple tarts and peanut cookies are good? Thurs: Indonesian lunch at aunt's place, more house visits where we had bak gua and homemade cookies thrust on us. Then we had dinner with family friends at the club where we had yu sheng, satay beef and chicken with vermicelli, wasabi prawns and other dishes I can't remember. Fri: Lunch with father at Whitebait & Kale. Fish & chips and fruit pavlova for dessert. Ai yai yai. I figured since I had started the whole week eating, I might as well finish the week off eating and start all over again on Mon. Otherwise, my New Year was pretty good. Same old same old going through the rounds - father's side in the morning, which is finished in two visits, and the rest of the day for mother's side, which is huge. We were done by about 6ish, and that's with skipping 3 houses. And happily, I escaped being asked the question all singletons dread being asked by inquisitive aunties. With the exception of my dai kou fu, who when I said goodbye to him, grasped my hand, gave it an extra nudge and said, "So when are you going to invite me?" And added mischievously, "You know what I'm talking about right?" *wink wink nudge nudge*. But it's ok, dai kou fu gives big hongbao so I forgive him. hehe. I told him to wait long long. 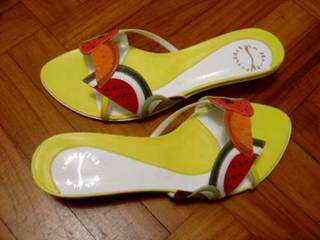 The Manolo, I think he would be very proud of me, because yesterday I bought this pair of fruity goodness from Tangs at 50% off. It makes my mouth water just looking at them. ...CNY cookies, picking less balls at tennis, Direct Manga downloads, cheongsam tops, trying to eat less and exercise more, The Apprentice, my new glasses, Hunter S. Thompson, the colour green, smelling like a Dirty Girl. 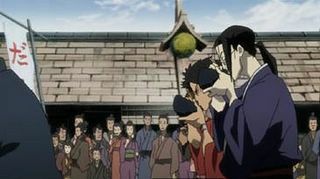 All too soon, my three days of tai-taidom have ended. I didn't manage to do everything on my list, but at least I managed to get the most important things accomplished, like going to the dentist (no cavities, yay! ), getting my spor shoos (discounted somemore) and getting my facial (beautiful smooth skin, hurrah). And now it's Thurs and I'm back at work again. Bpptth.